Burley. Note the child crank in the stoker's cockpit. This is my oldest (just under 8yrs. old at the time) as we finished an M.S. ride. Here I am with all three stokers the same summer, the little ones are 4 yrs. old in this photo. Another with one of the twins from a couple years later, note the absence of the child crank. Last edited by cranky old dude; 03-26-08 at 05:43 PM. 2006 Clean Air Ride, Withlacoochee, FL. Stoker's first century. Also pictured in Co-motion 2007 catalog!! malkin and i during some spring training in slc. all the pics of riders in beautiful weather are making us jealous! here are some photos of my "DARK SHADOW"
How about a happy tandem pair from the Winter of '88-89? Here's two of us. The first one is also in the 2008 Co-Mo catalog. This was taken during the GEORGE STREET BIKE CHALLENGE FOR MAJOR TAYLOR, on July 29, 2007 in Worcester, Mass. It is an uphill time trial for a distance of 500 feet at an average grade of 18 percent. What fun! The second picture was taken on a training ride in Western MA. These are great pictures! 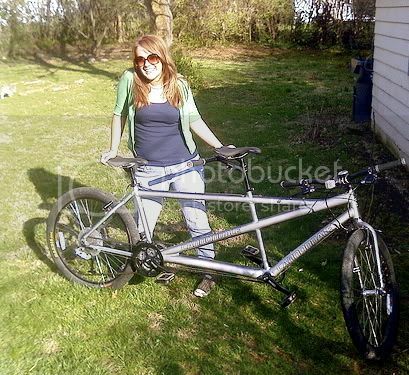 I want a tandem! T! 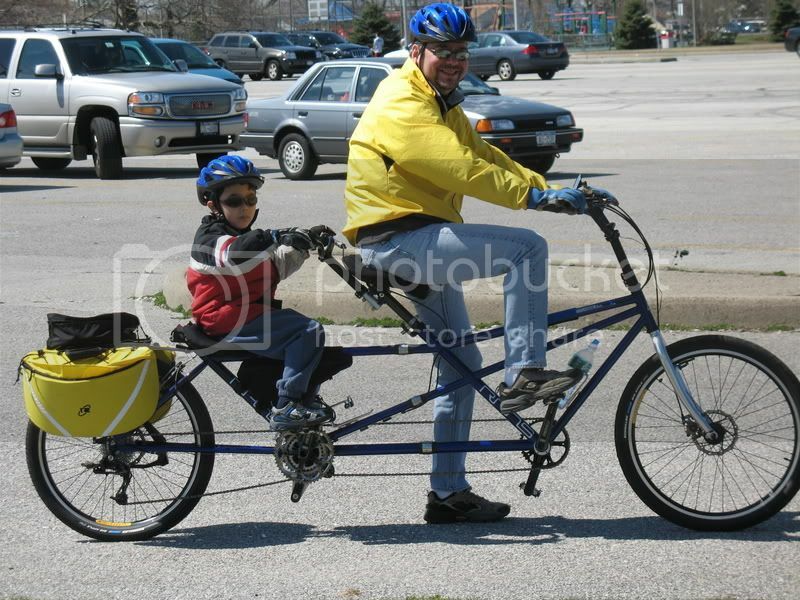 Owned a couple of those nice front-and-rear-half Burley tandem T's way back when and used to get lots of comments on them! some nice rides along the Erie Canal this season. Joanne and I are on the old Route 66 bridge over the Mississippi at St. Louis. 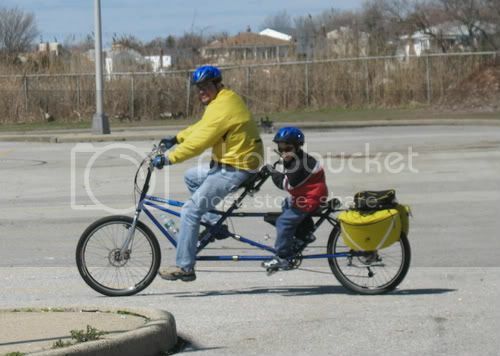 Here's my 6 year old son and I on our RANS Dynamik Duo. It was 63 degrees yesterday and it was really good to get out. I liked this thread so much I had to add my own pics! These are from 2007 Ride the Rockies (coinciding with our 30th anniversary). Anyone can stay married 30 years as long as you remember that the stoker is always right! We've been tandeming since 1999. There are a slew of photos of us on our website at http://www.s2cycle.com. Don't know why it took this long to discover this forum. I ended up here trying to learn about our new Garmin Edge 705. Then I found the tandem group. So here's our most recent photo (Spring Break in San Diego last week). Only the stoker since the captain is the photographer. Here's one from the first day we bought it at a garage sale a couple years ago. In the meantime its gotten some slick tires, and we got married The bike is nothing fancy (Motiv) but we have a blast on it, and get at least a few hundred miles in during the nice weather. And us, courtesy of msincredible. These are Bill (79) and Mary (74). We encountered them on the Paul Bunyan trail, near Hackensack Minnesota. They had been out for 12 days, had ridden across Minnesota from Iowa to the Canadian border and were on their way home. My stoker, Marcia, took the picture.